More than two million Americans die annually, some suddenly and others after long-term struggles with chronic disabilities or disease. Considering the dying process in advance lets people choose their end-of-life preferences, allowing them to remain in charge of their health care even after they are no longer able to make decisions. 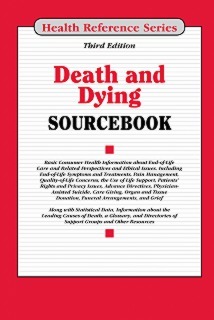 Death and Dying Sourcebook, 3rd Edition, provides information about end-of-life perspectives and the medical management of symptoms that can occur as death approaches. Part I: End-of-Life Perspectives begins with a description of the physiological process of dying. Cultural and spiritual concerns that impact end-of-life decisions are also discussed, and chronic illness in old age along with research findings about end-of-life care are described. Part II: Medical Management of End-of-Life Symptoms begins with an explanation on what is palliative care. Some of the common problems related to end-of-life care are discussed and is followed up with the treatments for pain, fatigue, and other symptoms during palliative care. It describes artificial hydration and nutrition, wound care, and cognitive disorders common at the end of life. Specific information for cancer and dementia patients is also included. Part III: Medical Decisions Surrounding the End of Life presents facts about life support choices, termination of treatments, organ and tissue donation, physician-assisted suicide, and autopsies. It also provides specific information for commonly experienced end-of-life issues related to Alzheimer disease, advanced cancer, and HIV/AIDS. Part IV: End-of-Life Care Facilities offers guidelines for evaluating care facilities and selecting options based on the needs of patients and caregivers. Hospice care, long-term care, home care, and other alternatives are described. Part V: End-of-Life Caregiving has practical information for caregivers about coordinating communications among patients, families, and healthcare and support service providers. Topics include how to help at the end of life, the dying process, what to do when death occurs, and self-care tips for caregivers. Part VI: Death and Children: Information for Parents provides advice about caring for terminally ill children and grieving the death of a child. Guidance for helping children cope with death, funerals, and grief is also presented. Part VII: Legal and Economic Issues at End of Life presents guidelines for advance directives, powers of attorney for healthcare, living wills, financial assistance, taxes, and social security issues. It also describes patients’ legal rights, the Family and Medical Leave Act (FMLA), and the duties of an executor. Part VIII: Final Arrangements offers practical information about types of burials and expenses, planning funerals or memorial services, certification of death, and how to facilitate arrangements if death occurs while traveling. Chapters on grief which address bereavement, how to help grieving people, and tips for working through grief are also included. Part IX: Mortality Statistics includes global and national mortality trends and the leading causes of death in the United States, life expectancy at birth, and common causes of fatalities. Disparities in deaths from suicide, alcohol and stroke are also discussed. Part X: Additional Help and Information includes a glossary of end of-life terms, a directory of support groups for end-of-life concerns, and a directory of organizations able to provide more information about death and dying.